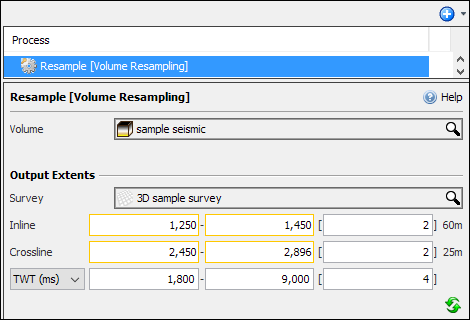 Description Resample volumes temporally, adjust sample rates, perform time-depth conversion and extents (for 3D). This process takes an input volume and creates a result with different spatial and vertical extents. 2D data is limited to vertical resampling only. The process also converts between time and depth if Time/Depth Conversion is configured. * When downsampling (increasing the sample interval or increment), apply an anti-alias filter first. * Time/depth conversion using the project settings is disabled in workflows. * The process creates spatially interpolates new traces using bi-Lagrangian interpolation. * The vertical interpolation is determined by the class settings of the volume. Warning: This process should NOT be used to vertically resample or perform time/depth conversion on a velocity model. Use a Velocity Conversion process to resample velocities. This process should only be used to add or remove whole traces from a velocity model. In the Details Panel, select the input volume to be resampled at Volume. In the example, a 3D volume is chosen. At the Output Extents section, select an output Survey. Type the range of Inline extent, Crossline extent, and time/depth extents (TWT/TVDSS) for the resampling process and the respective sample intervals. 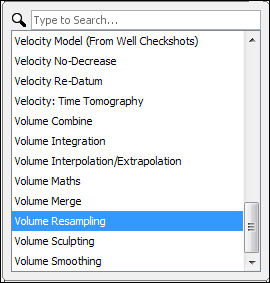 You can resample the volume vertically along with time/depth conversion if you have defined a velocity volume for the time/depth conversion (see Converting Time-Depth). Note: Click on the Reset icon to reset the values to the default. As a result of this process, a new resampled volume is available in the Volume tab.